Drew Nieporent has scaled many mountaintops during the course of his storied restaurant career. He was among the pioneers who led the fine-dining exodus out of midtown (to his Tribeca restaurants, Montrachet and the Tribeca Grill), and he helped turn Asian fusion into a respected branch of haute cuisine (at Nobu, and its subsequent outlets). But Nieporent’s latest venture, called Corton, may be his greatest challenge of all. His chef is Paul Liebrandt, a tempestuous diva of the old school who has a reputation for conjuring up impractical, brilliantly abstruse recipes, then bolting (or being fired) from the kitchen shortly thereafter. The mannered, Continental type of cooking Liebrandt and Nieporent are attempting to peddle has been losing market share to the casual Greenmarket style of dining for years. Then there’s that fearful sucking sound emanating from Wall Street. The city’s cratering economy has already wiped out a sizable portion of Corton’s potential clientele and threatens to take many of the city’s gilded, big-money dining establishments down with it. Of course, Nieporent’s past success insulates him somewhat from the raging economic hurricane, which may be why Corton has such a snug, cosseted feel. 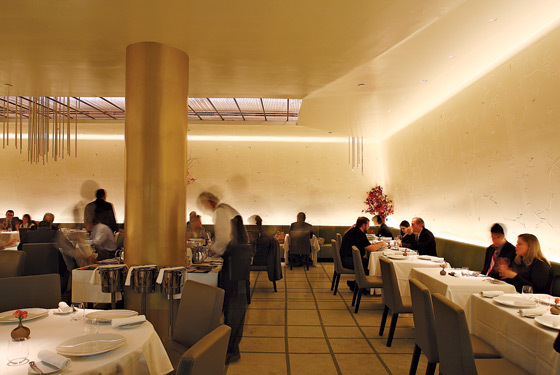 The windowless Tribeca space is the same one that used to house Montrachet (like that restaurant, Corton is named for a wine region in Burgundy). But the room has been stripped of all its old baggage and clutter. The state-of-the-art kitchen is set behind a sleek black partition and is visible from the dining room only through a narrow, bunkerlike window designed, it occurred to me, to show the cooks at work while keeping the chef’s tantrums from public view. The tables are covered with white linen and set with pink roses. The whitewashed walls are bottom-lit, like a giant fresco, and stenciled with butterflies, birds, and sylvan tree branches colored here and there with a solitary gold leaf. There’s a peaceful, palate-cleansing quality to all this icy, Altoid whiteness, and as dinner progresses you get a sense of time suspended, of being pleasantly inoculated from the cares of the outside world. Peace and light aren’t Liebrandt’s usual M.O., of course. The English wunderkind (he’s only 32) has been known to sprinkle eel with crystallized violets and flavor his côte de boeuf with coffee grinds before theatrically finishing it in clouds of burning hay. But on this latest tour through the New York restaurant jungle (this is his fourth in eight years), the perpetually promising chef has found his footing. There are only six appetizers and six entrées on the menu (the three-course prix fixe costs a reasonable $76, and an eight-course tasting menu is available for $110). The recipes are, as it turns out, heavily informed by the Greenmarket aesthetic, and that’s for the best. The avalanche of seasonal ingredients (squash, fall mushrooms, the inevitable “farm-raised” egg) appears to have tempered Liebrandt’s flamboyance and focused his creativity. The showy pyrotechnics have disappeared, replaced by food that’s technically complex without being exhibitionist, highly refined without being effete. A good soup is always the test of a first-class kitchen, and Liebrandt produces two that are worth the price of admission. One is a smoky velouté, made of Jerusalem artichokes, which combines the sweetness of summer (a deposit of Peekytoe crab lurks at the bottom) with the rich earthiness of fall. The other is a squash soup, which the waiter pours over a little tower of porcini mushrooms seized in tempura batter. Underneath the tempura is porcini relish, and laid around it like shingles on a house are little mushroom-shaped tuiles that dissolve into the dish as you stir it. I was prepared to hate a similarly delicate, pretentious-sounding medley of boutique vegetables (lovage, sorrel, baby eggplant, and potatoes) called “From the Garden,” but ended up gobbling it down like a horse. Ditto the foie gras torchon, which Liebrandt encases in a beet gelée (a technique he used at his last restaurant, Gilt), as well as the soft, candied chunks of sweetbreads, served with carrots, brown butter tuiles, and a single perfectly cooked egg. Veteran Liebrandt-watchers know that when the main courses roll around, things can go haywire. But not this time. The first entrée I sampled was an expertly cooked medallion of squab, garnished, in a skillfully restrained manner, with pears, puréed chestnuts, and the slightest hint of bacon. It was followed by a procession of almost willfully standard restaurant foods (lobster, beef, chicken, sea bass), each one more ingeniously prepared than the next. My pink butter-poached lobster (Liebrandt’s a master of the slow-cooking sous vide technique) was scattered with toasted hazelnuts sweetened with puréed apples, and my neighbor’s Black Angus beef filet was made denser and more flavorful by the presence of braised oxtail and a platoon of fresh baby beets. Liebrandt’s version of striped bass is mysteriously sweet (it’s mingled with onions and hints of sansho pepper in a milky razor-clam broth), and the ornately plated Label Rouge pasture-raised chicken from France is smothered in a deliciously complex brown-bread jus. Does the harried, burger-chomping eater of today have time for this rarefied brand of cooking? Possibly not. But in this era of encroaching restaurant gloom, it’s a relief, at least for one evening, to see things being done right. When I dropped in, Nieporent was checking coats at the door and perambulating bottles of wine around the room. The wait staff are attentive and admirably well versed in their chef’s arcane recipes. And the desserts, by pastry chef Robert Truitt, do what desserts in grand restaurants are supposed to do: They end the meal on a climactic high note. The worst, my tasters agreed, was a wan, tepid dish called “white sesame crème”; the best by far was the “caramel brioche.” This delicate amalgam of brioche, caramel, and passion fruit is pretty to look at, technically ingenious, and delicious to eat. Like many things at Nieporent’s polished restaurant, it combines the best qualities of modern cooking with the vanishing world of haute cuisine, brings them together for one last curtain call, and makes them sing. Hours: Monday through Thursday 5:30 to 10:30 p.m., Friday and Saturday 5:30 to 11 p.m.
Prices: Three-course prix fixe, $76; eight-course tasting menu, $110. Ideal Meal: Veal sweetbreads, wild striped bass or chicken for two, caramel brioche. Note: The very good wine list is diverse without being overblown, and fairly priced. Scratchpad: The talented Liebrandt could bolt at any moment, so get there while you can. One star for the room, one for the service, and another two for the cooking.